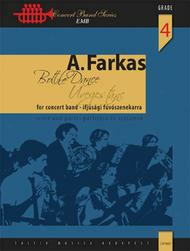 The forerunner of the Bottle Dance was written for the Blue Danube Harmonica Band in the early 1960s. Later, at the instigation of the excellent folk dance choreographer Miklos Manninger, an arrangement for wind band was prepared, in order to widen the ensemble's repertoire of German national pieces by the addition of a Hungarian dance. The production scored a resounding success not only with the audience but also with the musicians who performed in it, with the result that before long the composer prepared from the Bottle Dance an independent work for wind ensemble - a showy piece, virtuosic in its effect yet easily playable. The youth orchestra arrangement is a simplified andshortened version of the work for full-scale orchestra. The forerunner of the Bottle Dance was written for the Blue Danube Harmonica Band in the early 1960s. Later, at the instigation of the excellent folk dance choreographer Miklos Manninger, an arrangement for wind band was prepared, in order to widen the ensemble's repertoire of German national pieces by the addition of a Hungarian dance. The production scored a resounding success not only with the audience but also with the musicians who performed in it, with the result that before long the composer prepared from the Bottle Dance an independent work for wind ensemble ╩ a showy piece, virtuosic in its effect yet easily playable. The youth orchestra arrangement is a simplifiedand shortened version of the work for full-scale orchestra. Antal Farkas (1925-1992) komponierte hauptsachlich fur Blasorchester und Blaser-Kammerensembles. Der Flaschentanz gehort zu seinen beliebtesten Werken. Der Vorlaufer des Stuckes entstand in den fruhen 1960er Jahren fur Akkordeonorchester. Auf Initiative des ausgezeichneten Volkstanzchoreographen Miklos Manninger fand spater auch eine Bearbeitung fur Blasorchester statt. Nicht nur beim Publikum, auch bei den ausfuhrenden Musikern hatte das Stuck durchschlagenden Erfolg, deshalb komponierte Farkas vom Flaschentanz bald darauf ein eigenstandiges - eindrucksvolles, virtuos wirkendes - und dennoch leicht spielbares - Werk fur Blasorchester. Die Bearbeitung fur Jugendorchesterist eine vereinfachte und verkurzte Fassung der Fassung fur grosses Orchester. Impregne des caracteristiques des styles de danses populaires hongroises, Bottle Dance est une oeuvre espiegle, remplie d'effets virtuoses. Les exigences techniques restent neanmoins raisonnables. Devant le succes de sa version originale pour Orchestre d'Harmonica, Antal Farkas a decide de renouveler l'experience en realisant cette version pour Orchestre d'Harmonie. La "danza della bottiglia" fu scritta per la Harmonica Band Danubio Blu all'inizio degli anni '60. Visto il grande successo della danza fu deciso di crearne un arrangiamento per banda. Bottle Dance si presenta al pubblico come un vero show, con effetti virtuosi e spettacolari.